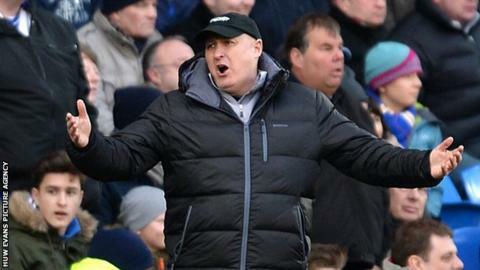 Cardiff City manager Russell Slade says he has "not given up" on reaching the play-offs. Saturday's 2-0 defeat against Derby was Cardiff's fourth straight loss in all competitions leaving them 13 points off the top six and just seven above the bottom three. Slade is not concerned that his side are on a downward spiral towards League One. "I don't see that happening, not with the group that we've got," he said. "It can happen. It's happened to the likes of Wolves in the past." Derby striker Chris Martin had an early penalty saved after Cardiff's Aaron Gunnarsson was judged to have caught him while clearing the ball away. The visitors then took the lead when City's Scott Malone turned Jamie Ward's low cross into his own net. Martin doubled Derby's lead in first-half injury time, heading home his 19th goal of the season. Slade admits his target of getting Cardiff into the play-off positions is slim, but it can still be achieved. "It's not impossible. It's becoming a little less realistic that's for sure, with the amount of points we've got to make up" he said. "But that's not to say that we've given up. "There's no reason why we can't go and win our next game and then gain some momentum over the coming weeks. "It's been a tricky period, a difficult period to navigate through. "We've played some good teams and we've shown that we are short of that level at this moment in time." Cardiff are away to 10th-placed Sheffield Wednesday on Saturday 7 February and Slade denied he is under pressure. "No. We are under pressure every day," said Slade. "It's been a difficult period...we would hope that we can come out the other side and put a run together." Top scorer Kenwyne Jones was on the bench for the visit of Derby despite scoring six goals in his last eight matches for the Bluebirds. When he came on against the Rams he forced a good save out of County goalkeeper Lee Grant with a header and looked the player most likely to score. Slade says he picked Alex Revell to start, due to the formation he decided to use, with the former Rotherham forward supported by two wide players. "It maybe a different case against Sheffield Wednesday next week, who knows?" said Slade.